The MacRebur plant in Lockerbie will take rubbish which would have gone to landfill to help produce asphalt. A one-kilometre stretch of road made with its mix would use the equivalent of about 684,000 plastic bottles or 1.8m single-use plastic bags. Chief executive Toby McCartney said the opening of its first factory was an "important milestone". He said it would help to tackle both plastic waste and potholed roads. The new factory will granulate rubbish which would otherwise have gone to landfill. The granules are mixed with an activator to make the plastic bind and it is then bagged ready to be distributed to asphalt producers. The company said its mix allowed the bitumen used in the production of asphalt to be extended and enhanced, reducing the amount of fossil fuel used. If the company's claims are right about the robustness of its product, plastic roads could be a game changer. We all know what a nuisance potholes can be. If we can reduce them while putting waste plastic to good use it's a double whammy. Conventional roads use crude oil to make bitumen which binds the rocks, limestone and sand. This new process replaces some of that oil with plastic. And there's apparently a "secret ingredient" in there too. Trials have taken place in a few areas including Dumfries and Galloway and Aberdeenshire. MacRebur say they are also working with Tesco to fix some of their car parks. And they have just agreed a £1.6m deal with the Department of Transport to test the technology in Cumbria. Confidence in them is growing. So much so they have now opened this factory near Lockerbie so they can make their own recycled plastic pellets rather than buying them in. But we will have to wait and see what a hardy Scottish winter will do to their claims. And their roads. Mr McCartney said: "Our technology means that we can not only help solve the problem of plastic waste but also produce roads that cope better with changes in the weather, reducing cracks and potholes. "That's because our roads are more flexible thanks to the properties of the plastic used in them, so although a MacRebur road looks the same as any other, it has improved strength and durability. "Our technology also means there are no plastic micro beads present in the mix and we can even recycle the road at the end of its lifespan, creating a circular economy that is sustainable and cost effective." MacRebur roads have already been laid around the world from Australia to Yorkshire using plastic waste processed by waste companies. The new factory, which has created 12 jobs, brings the processing in-house with the hope of building further factories across Europe. Mr McCartney said: "Our ultimate aim is for local rubbish to be used in local roads and MacRebur factories will help us achieve this by allowing waste plastic to be processed and mixed with our additive for use in asphalt." 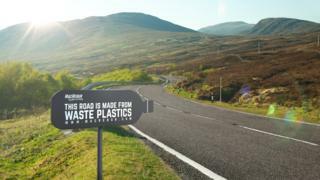 Video Can plastic roads help save the planet?